In late 2009 Heritage Watch, a non-profit organization dedicated to the preservation of Southeast Asia’s cultural heritage, was awarded the AIA Site Preservation Grant for a project at a remote temple site in Cambodia. The overall aims of this two year project are to ensure the long-term protection and preservation of the Banteay Chhmar archaeological site by providing education and training in English Language, Guide Training, and Heritage Protection to local community members. Banteay Chhmar is located in far northwest Cambodia near to the border with Thailand. This remote temple complex represents one of the great architectural masterpieces from the Angkorian Period (802 AD-1431 AD) built by King Jayavarman VII. The site was constructed during the end of the 12th century, the same period as many important sites at Angkor, such as the Bayon temple complex, the five entrance gates to Angkor Thom, and the Buddhist monastic temple complexes of Ta Prohm and Preah Khan.Banteay Chhmar is home to a number of outstanding examples of Bayon-style visages, bas-reliefs, and historical inscriptions. After the fall of the Angkorian Empire in 1431, the site entered a state of fast decline and destruction. Over the years jungle growth and trees have engulfed the site causing major structural damage throughout the complex. Due to its location, the area of Banteay Chhmar was subject to heavy fighting between the Khmer Rouge and government forces from the 1970s to the 1990s. During this time Banteay Chhmar became a target for intense looting and many of the site’s unique bas reliefs and statues were dismantled and presumably sold in the illegal antiquities market. In 2008 Global Heritage Fund (GHF) began a major development and conservation program at Banteay Chhmar. 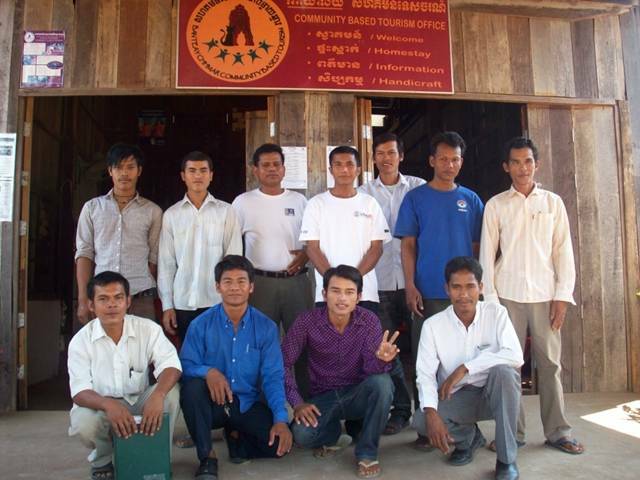 Their five-year project is currently providing training to local Cambodians in stone conservation techniques and methodology to ensure long-term conservation of the site and community stewardship. 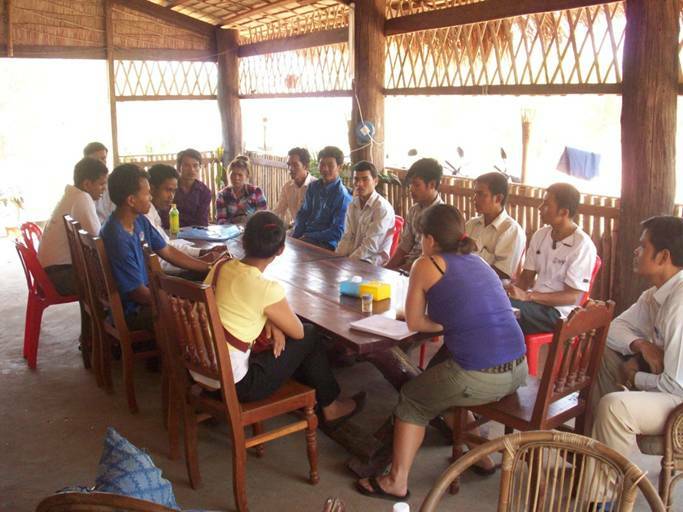 As part of the overall development project with GHF, Heritage Watch is working in collaboration to educate and instruct the local Community Based Tourism (CBT) group in Heritage Protection and Guide Training to assist these individuals in becoming certified guides for the Banteay Chhmar heritage site. In March, April, and May 2010 Heritage Watch staff traveled to Banteay Chhmar to meet with Community Based Tourism (CBT) members, discuss the project, and gain feedback from the local community regarding the implementation of the project. Heritage Watch’s goal was to ensure the community’s involvement and participation in the project. 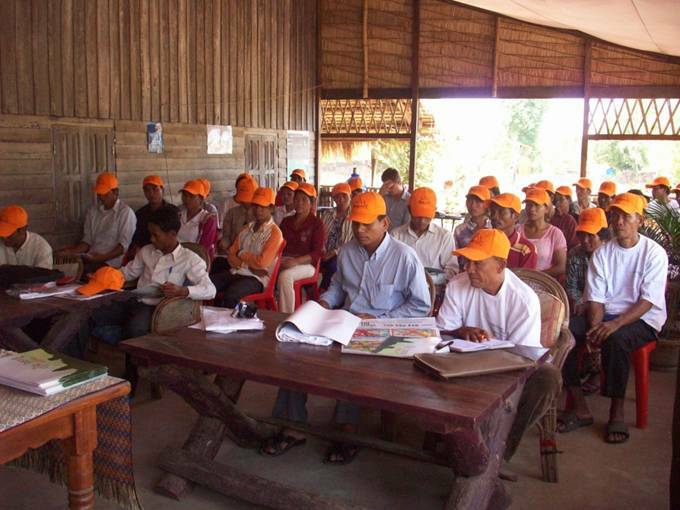 The first part of the Heritage Watch project at Banteay Chhmar was to provide selected CBT members with English Language Training. As English is one of the most widely spoken languages among visiting tourists, Heritage Watch determined that it would be most useful for the CBT members to be trained in English. The next step was to decide which members of the CBT group would take part in the overall training program. Out of 50 participants, 14 were chosen to participate. Individuals were selected by conducting a basic English Language assessment to determine who had the skills necessary to participate. To conduct the assessment, Heritage Watch recruited two English Language teachers—one Cambodian, Bunthan Am, and one Australian, Darryl Tynen—to travel to Banteay Chhmar and conduct the testing to determine the level of English of each participant. After compiling the results of the exams, 14 individuals were selected for the program and it was determined that the group would be separated into two levels of English classes, including one beginner and one intermediate. With the students selected and English levels determined, the next step was to find an English Language teacher. Considering the remote location and lack of basic facilities such as running water and electricity, this was no small task. Fortunately, after one month of searching, a highly qualified and experienced English Language teacher, Andrew Marino, stepped forward for the job. Next Heritage Watch needed to design a curriculum and source teaching materials and resources. The two volunteers, Bunthan and Darryl, kindly offered their services and designed a thorough curriculum and extensive bibliography of resources. After another week of gathering the teaching materials, the Heritage Watch team and Marino traveled again to Banteay Chhmar for a final meeting with all the students to confirm the start of the English Language program. As part of the overall project, Heritage Watch will implement four Heritage Protection Workshops by the end of 2011. The first workshop was conducted in April 2010 and involved all of the members of the CBT group. At the first presentation only the CBT members were present. The presentation was designed to provide a basic understanding of cultural heritage and the impact of tourism at heritage sites, specifically in relation to Banteay Chhmar. Additionally, the issue of looting of archaeological and heritage sites was discussed. Heritage Watch published a comic book and a children’s book in Khmer focusing on looting in Cambodia and its impact, as well as other information in both Khmer and English. The three remaining workshops will involve larger communities in the Banteay Chhmar area including schools, teachers, monks, and local government organizations. The English Language Program officially commenced in June 2010 and the CBT members devote four hours a day, five days a week, to their studies. The next stage in the project revolves around developing the Guide Training Program. Heritage Watch is now organizing professionals and academics to contribute to the publication of an official Guide Training Manual for the program and designing the Guide Training program itself. The Guide Training will commence after CBT members have completed 12 months of English Language training. Afterward, those individuals who have passed the course will begin two months of intensive Guide Training under the tutelage of Khieu Thy, an experienced Cambodian Tour Guide and historian.